About a month ago, I was cooking dinner, and something caught my eye on my back deck. A tiny black kitten was sitting on our deck chair! Upon further inspection, I saw that this kitten had siblings! A total of three adorable, fuzzy kittens were dancing around my deck! While I love cats, and had two while growing up, my husband and son have cat allergies, so I resisted my initial reaction of "Can we keep them?" My next thought was, "Now what do I do?" 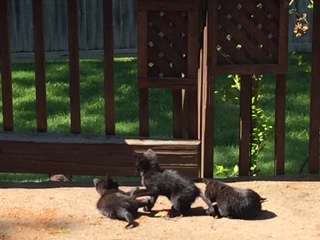 Off to the ever-helpful Madison Area Parents Facebook page with a plea of "Three adorable black kittens running around my deck. I think they live under our deck. What do I do?" Responses about St. Huberts not accepting Madison strays (because town needs to pay for them to be animal control), and "let them be your pets!" poured in. One neighbor offered her friend's help (she apparently catches kittens a lot). Another informed me of a flyer she got in her mailbox from a different neighbor, Judy Degennaro, who has been dedicating her time and own money to TNR (Trap/Neuter/Release) in our neighborhood for the past few years to humanely help control the exploding feral cat population. She and another neighbor, Robin Flood, who has been helping her with the cats, have been to several of the town's Board of Health meetings. Robin even arranged for representatives from People for Animals (where they take the cats for TNR) to speak at the meetings. They haven't received help from them the Board of Health, and they are not sure if they will. Our area of Madison, between Ridgedale Avenue and North Street, near the Kirby Center/Lucy D Anthony fields, has an astounding number of feral cats. Near my house closer to Ridgedale, not as many (I have seen two--obviously a male and a female, now that we have kittens! ), but as you get closer to North Street, the number of cats is ridiculous. I'm talking hundreds! Over the past 2 years, Judy has TNR'd 39 cats in Madison (and another 11 helping friends in other towns). TNR is a humane way to address the problem of a feral cat population and is scientifically proven to be the only method that works! Euthanasia or removal are not only cruel but ineffective because they create what is known as the ‘vacuum effect’ as cats from neighboring areas spread out and fill in the void. 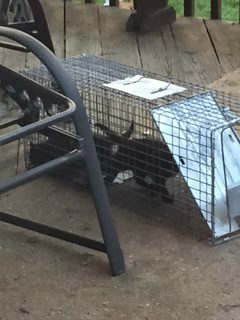 With TNR, the cats are spay/neutered and inoculated, then released back where they were trapped. The biggest benefit of TNR is to stop and then reduce the population, which would otherwise grow quickly (a female can have 3-4 litters a year, 3-5 kittens per litter). The cats are inoculated at the time of treatment to reduce the risk of rabies and other communicable diseases. Some other benefits of TNR are that much ‘nuisance behavior’ is eliminated: the females do not go into heat and yowl, the males do not spray to mark territory and are less aggressive - the territorial warfare between male cats is stopped, reducing the noise and the spread of disease. Kittens 8 weeks or younger can be ‘rescued’ from a life in the wild and ‘socialized’ to lose their fear of humans and become adoptable pets, but this takes time, patience and money for wellness care. Thankfully, Judy and Robin set up a trap on my deck, a trap on my lawn, and a trap in my neighbor's lawn. (The kittens and mama were seen a lot near their shed.) They checked the traps every couple of hours. They caught two of the kittens the first night, and the mama the next morning. The third one was caught the next evening. I was so worried for him! He must have been so frightened without his mama and siblings! The mama, a beautiful grey cat whom Judy named Sterling (she has to give each cat a name for identification when she takes them in for TNR), has been TNR'd and is back roaming my neighborhood. The kittens are being fostered at Robin's house, and being tenderly cared for while they get acclimated to humans so they can be adopted out. They just got their shots and are dewormed. Molly, the most gregarious one, was the first to purr for them, and loves to play. Maggie is the other female kitten. Buddy, the only male in the group, was the last to be caught and is the shyest. He purred for the first time just yesterday (almost two weeks since he was caught), which is a big step.